Proper car care and attention is the secret to enjoying happy journeys! 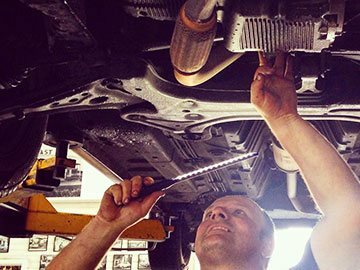 If you are looking for a car service expert and a mechanic who is an all-rounder in Fairfield, then bring your car in for a treat to All Types Automotive. Committed to providing comprehensive car services, motorists throughout Fairfield and beyond can rely on us to keep their car running on the road. People with well-maintained cars travel with peace of mind; knowing that the possibility of their car breaking down is minimal. Taking in your car for regular car service to a Fairfield car service provider is extremely important if you want your car to be in a good condition. However, you must make sure that the car service provider you select in is a reliable and well-reputed one. At All Types Automotive, we aim to meet and exceed the expectations our customers have regarding receipt of efficient and effective car service. We are professionals who know how to do our job well! At All Types Automotive we do not take our customers for granted. By ensuring they are kept up to date with every step of the repair process we strive to deliver a higher standard of service. Possessing extensive training and experience our mechanics help Fairfield residents ensure their cars handle and perform safely and according to specification. Thanks to our expert touch we can deliver specialised Audi servicing to Fairfield residents and others in surrounding suburbs. By accurately analysing and repairing your vehicle with precision we aim to extend the life of your vehicle. Showcasing leading vehicle design and manufacture Audi have gained a strong reputation for the quality and comfort that drivers of their vehicles experience everytime they get behind the wheel. As a high-trained team specialising in the repair and maintenance of prestige European vehicles All Types Automotive are just who you want to hire for a complete Audi service in Fairfield. Using accredited parts and components our mechanics and technicians can improve the handling and performance of your Audi with ease. Are you looking for a passionate team to keep you BMW on the road? With our service options Fairfield motorists can rely on All Types Automotive to deliver a competitively-priced and premium level of attention. Drawing extensively on our years of firsthand training and experience our experts can conduct detailed inspections and servicing on BMW vehicles to prevent minor issues from developing into major faults. Requiring a high level of care, attention, and precision, BMW-produced luxury vehicles deliver a driving experience unlike any other. Offering outstanding and personalised BMW service solutions to Fairfield motorists All Types Automotive can extend the life and quality of your immaculate BMW through our use of durable and premium parts and components. Drawing on our years of training and hands-on experience our innovative mechanics can conduct comprehensive Mercedes servicing on prestige vehicles throughout Fairfield and the greater Melbourne metropolitan area. Often seen as the prime example in German, and European, engineering Mercedes Benz made vehicles deliver comfort and quality to every car they make. Possessing the training and experience necessary to complete a comprehensive Mercedes service for Fairfield motorists and others in the surrounding suburbs. Taking into account the age and model of your Mercedes our skilled and hands-on technicians can restore your Mercedes to its former glory. Have you been looking for a skilled team to undertake in-depth and personalised major and minor servicing? At All Types Automotive we can conduct detailed and through VW service solutions for our Fairfield clients. From Beetles to Polos we can keep your car operating to specification. At All Types Automotive we go above and beyond to deliver an unmatched and comprehensive servicing, maintenance, and repair experience to motorists living throughout Melbourne’s metro area. With our second-to-none all-encompassing VW service Fairfield Volkswagen owners who care about their vehicle can trust us to ensure their vehicle continues to operate to the highest standards. To find out more about our detailed and reliable approach to servicing call us today on 03 9469 2933.